Controversy has surrounded potential management plans for the Children’s Pool at Casa Beach since seals formed a rookery on its shores more than a decade ago. One of the most recent attempts at regulating interactions between humans and seals has been hiring a park ranger using private funds secured by District 1 City Councilwoman Sherri Lightner’s office. 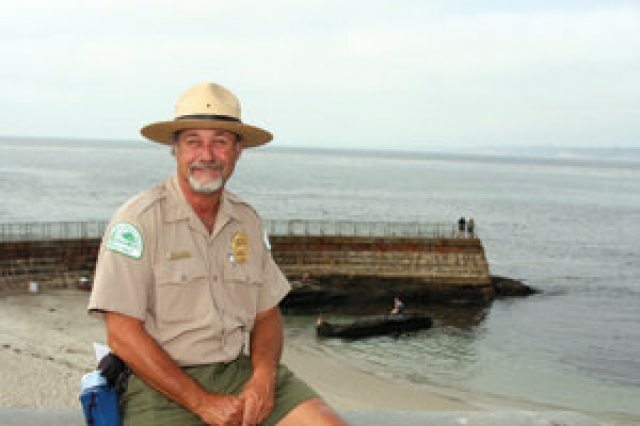 Randy Hawley, who became the city of San Diego’s first park ranger in 1989, interrupted his retirement to supervise the area as a provisional employee while the city searches for a full-time ranger. Hawley began patrolling the area in early July, and said he usually spends Saturdays and Sundays monitoring the beach. “I’ve found that the late afternoon is the best time for me to be there because that’s when the seals start to come up on the beach,” he said. Based on the City Council resolution passed in May, Hawley said, his job is comprised of three main responsibilities: public outreach and education on the beach itself; evaluating and revising the signs surrounding the area; and creating a docent program to assist the ranger. Hawley said he receives mostly positive responses from visitors who come to see the seals. However, he added, there have been some hostile encounters. When it comes to controversy surrounding plans for the pool — including a year-round rope barrier — Hawley said he checks his opinions at the door. Drafts for new signs — which will describe permissible activities, proper behavior while seals are present, a water quality advisory and historical and cultural information — have been submitted to the director of the city’s Park and Recreation Department for review. SeaWorld will also review the signs for technical accuracy, and the National Oceanic and Atmospheric Administration (NOAA) to verify that the legal wording meets the requirements of federal law. Hawley said he expects the signs to be installed near the beach within 30 days. He also said that the city has begun accepting applications and is conducting interviews for the full-time ranger position. “It’s possible that someone could be in place by the end of fall or early winter,” he said. Some members of the community have argued that the ranger program is ineffective because his presence on the beach is limited. While it is still “unreasonable” to expect the subsequent full-time ranger to spend 40 hours on the beach, Hawley said, the docent program would help supplement coverage. He added that the program — which will be comprised of unpaid volunteers — is still in the initial phases. Though it has come with its share of trials, Hawley said he is grateful for the opportunity to serve at the Children’s Pool. Despite a recommendation from the La Jolla Community Planning Association (LJCPA), city hearing officer Ken Teasley approved an amendment to the Coastal Development Permit yesterday, Sept. 15, to allow the rope barrier at the Children’s Pool to remain in place year-round. Teasley also rejected the idea that the rope should be subject to analysis by the California Environmental Quality Act (CEQA). The barrier is currently in place from Dec. 15 to May 15 during seal-pupping, or breeding season. The rope serves as a visual guideline to suggest a safe distance between humans and seals rather than an actual barrier, and is not intended to limit beach access. Teasley’s decision is appealable to the city Planning Commission. LJCPA President Joe LaCava said the group will consider whether to file an appeal. What a waste of energy. Want to have complete segregation for the seals? Take down the rope, and these idiot parents who let their kids run among the seals will file a fine lawsuit against the city when little Muffy gets a set of 3″ fangs sunk into her calf. Of course it will be “the city’s fault” and as usual, the attorneys will find that San Diego must pay. Instant chainlink fence in 3…2….1…. Randy Hawley is a wonderful man and is truly someone who cares about nature and also wants to develop an appreciation for it in others. I met him 30 years ago when I was 16 at one of his first ranger jobs, and never forgot him since. He is a treasure that I hope San Diego will appreciate.